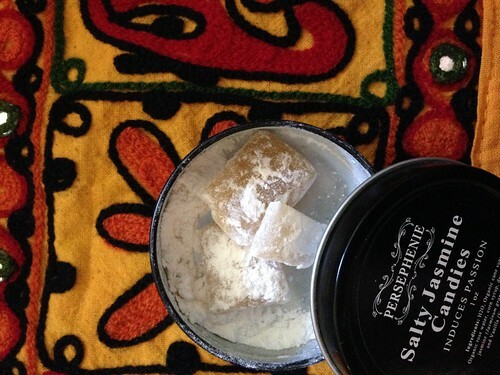 Persephenie's Salty Jasmine Candies indeed induce passion, as their subtitle promises. 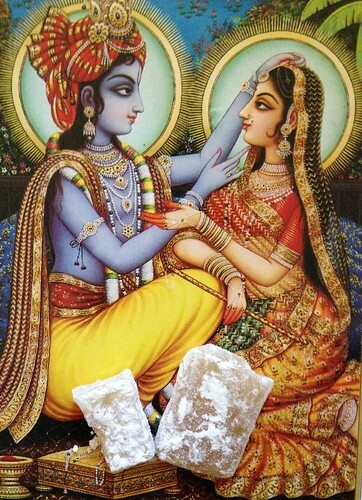 This is done by taking you by surprise with an explosion of jasmine absolute in your mouth These are little, unevenly sized and shaped flat sugar candies that are dusted with powdered sugar, which gives them the appearance of a dangerous substance. They are generously flavoured with jasmine oil. The result is a very bold, uncompromising experience, not unlike licking one's nose after it has accidentally touched the bottle of jasmine absolute you've just sniffed... Its saving grace from being too perfume and soapy is the balancing effect achieved by salt and a hint of vanilla. Both these elements enhance the flavour of the candy, its sugariness transforming into a more luxurious and caramel-like sensation in the mouth (even though in reality these are hard candies*). That mineral note is really quite fantastic and like what I've experienced in saline floral perfumes such as Vanille Galante (which is more of a lily-based concoction), and Emotionelle. For extra boost, eat those while you're wearing Emotionelle, for the salty-yet-sweet effect it creates by pairing jasmine with cantaloupe and violet. * Interestingly, in the heat of the summer, they have become more soft and taffy-like. Sounds so precious and enchanting!